Close to 400 delegates made up of Registrars and Directors of nurses, from both public and private sectors in Ghana, Nigeria, the Kingdom of Estwatini, Zimbabwe, Kenya, Botswana, Rwanda, Benin and South Africa, among others, are attending. The three-day conference is being hosted by the School of Nursing and Midwifery, University of Ghana, in partnership with Leadnurse Africa International Foundation, a Non-profit organization working in five African countries including Ghana. GreenPower Healthcare Limited, is also supporting the conference. Leadnurse Africa, was established by young nurses to help change the phase of nursing that was characterized by “negative public image” in modern times. The nurses are being taken through re-orientation, capacity building and other mentorship programmes to make them more efficient in their role in health care delivery. The conference, is therefore, engaging registrars and regulators of nursing institutions in Africa, to discuss proper regulation and training for the nurses who form 60 per cent of all health care workers. 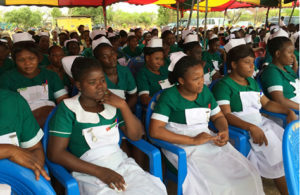 Ms Tina Mensah, Deputy Minister for Health, in a speech read on her behalf, commended the nurses for their role in providing primary healthcare to all communities, a critical effort in attaining the Sustainable Development Goals (SDGs). She said the work of nurses and midwives had a major impact on the delivery of other SDGs such as; education and poverty, which were all considered as the social determinants of health and the SDGs presented the nurses an opportunity to apply their knowledge to create a healthier and a better world. Ms Mensah urged the nurses and midwives to embrace and adopt collaborative strategies with other members of multidisciplinary health care teams to help ensure the delivery of evidence-based, cost-effective quality care, and better patients’ outcomes. Professor Lydia Aziato, Acting Dean, School of Nursing and Midwifery, in a keynote address, said the issue of spirituality among Africans, finance and seasonal diseases, were some major hindrances towards the attainment of the SDGs. “Spirituality affects a lot of the SDGs because it can lead to poverty, poor education, gender inequalities as most witches are women, unhealthy work environment and disharmony in communities among others. “I am of the view that the strong orientation of the African in terms of spirituality calls for all of us to take a second look at our health care system so we can accommodate the spiritual needs of our clients. “The combination of western medicine and the religion-cultural dimension will go a long way to satisfy the African client”. Prof Aziato also called for affordable health care for African people, especially for women with breast cancer, which was noted to be the highest cause of cancer deaths among women on the continent, adding that, the national health insurance should be extended to take care of the treatment of breast cancer. Mr Collins Ogbulu, Executive Director of LeadNurse Africa, said the conference was serving as a platform of conversation around the nursing practice and as a means to contribute toward proper healthcare to society. Mr Richmond Dayo Johnson, Chairman of Advisory Board of LeadNurse Africa, commended participants for their conviction and resolve to ensure that the practice of nursing was improved upon. He urged nurses to hold onto the dream and passion to care for and save humanity. Some of the participants in their goodwill messages, expressed the need for Africa to combine efforts to address re-emerging diseases like guinea worm, small pox and chicken pox, which, Africa had already dealt with, but back in some of the countries. They said the re-emerging diseases could derail efforts at attaining the SDGs, if the world did not join Africa to address the situation. Some also called for the need to increase efforts at poverty eradication on the continent, which was becoming a major hindrance to accessing quality health care.